BROADCOM MASTERS –Kyle Ryan ( Rye Neck MS) ranked top 300 NATIONALLY! EVERY HIGH SCHOOL STUDENT WE SENT TO NYS SCIENCE CONGRESS PLACED — simply AMAZING! Please be aware that payment must be completed before a student is considered entered. The HS ( school) pays for all students. An invoice is emailed to our school contact person. ** Please note when a student does self pay he/she is entered at the time the form submits ** When a school pays the teacher needs to obtain a link from JNewman@DiscoveryCtr.org to submit the students. If you are exhibiting at this year’s Fair? Please note you need to get a parent informational email . This email is the “final” game plan. Every year things are changed, please do not use previous year information. This year parent information will be emailed directly to the parents using the email address we have received on the Fair Permission Slip. If you did not fill out a Fair permission slip, please contact your teacher so they can provide you one. Once filled out return to your teacher. The teacher needs to fax it to us, we cannot accept things faxed from parents. If you have not been provided with this packet at least one week prior to the Fair check with your teacher. Please make sure that JNEwman@DiscoveryCtr.org is considered a “friendly” email account so nothing goes to spam. Please note you will receive a Student Email This email is the “final” game plan. Every year things are changed, please do not use previous years. This year student information will be emailed directly to all students regardless of whether you are self pay pr school paid. Teachers will also get a copy of this email. Please make sure that JNewman@DiscoveryCtr.org is considered a “friendly” email account so nothing goes to spam. Interested in Judging? Please read the current Judges letter to learn more about judging. Interested in Volunteering for the TCS Fair? Please fill out the appropriate form. Many schools made science projects a component of the science curriculum after Sputnik (October 4, 1957), in an effort to motivate and stimulate student interest in the field. In addition to teacher evaluation, students often entered in a school/district Science Fair for recognition and placement. Science Teachers Association of New York State (STANYS) initiated a State Science Congress for High School project candidates, from the sixteen local sections of the state, over forty years ago. Its purpose is to promote science research at the pre-college level. These students compete for placement and scholarships monies. Each Section can send three area finalists per one hundred participants, from a Regional Science Congress, to this event. Westchester Section STANYS was pleased to join with The Putnam Children’s Discovery Center, Westchester/Putnam Technology Educators Association and the Consortium of Scientists and Engineers to sponsor the first K-12 Tri-County Science Technology Fair in April 1994. Through this event students have the opportunity to display their work, learn from their peers and be inspired by parents, educators and professionals to pursue their interest in science. From the beginning, the Tri-County Fair has been open to participants in three grade divisions: K-4, 5-8, and 9-12. Categories are: Biology, Chemistry, Health & Medicine, Earth/Space Science, Engineering/Technology, Environment. Mathematics/Computers and Physics, High School has an added category: Psychology. All entrants present their projects both visually and orally, to a minimum of two judges comprised of scientists and engineers specific to their fields. The K-4 students are encouraged to develop their interest in science and accordingly awarded excellent or outstanding ribbons. Developing the problem solving skill at an early age ensures productive citizens in the future. Participants in the grade 5-8 and 9-12 divisions compete for first, second and third place in each of the respective categories. Middle School students in grades 6,7 and 8 have the added benefit to be chosen to compete in the Broadcom Masters held in the fall. High school students aspiring to STANYS Science Congress competition, must work individually on an empirical or theoretical research project. Please note, many corporations will match employee donations. The following have matched in the past. Please check with your company and “double” your gift by requesting a matching donation form. 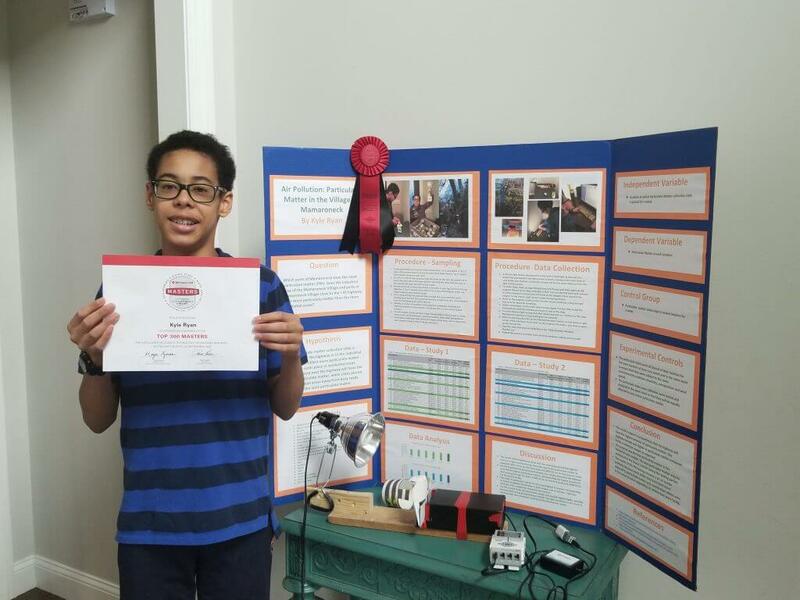 The Tri County Science & Technology Fair is annually organized by the Putnam Children’s Discovery Center for the purpose of sharing science with the community and rewarding children who spend their time creating innovative and well researched science projects. These students with support from their parents and teachers are interested in striving for academic excellence with a dedication and commitment to science and technology. The Fair is open to students in grades K-8 who have won first place at their local school fair and to high school students grades 9-12 who have been selected by their principal or science department chair to present original research or demonstrate a scientific principle. The high school students who have opted to enter original research have the added benefit of an opportunity to continue on to the NYS level. In the next few years it is anticipated that the Discovery Center will launch its Original Invention Convention which will provide new opportunities for students who have created a qualified project. Through this event students have the opportunity to display their work, learn from their peers and be inspired by parents, educators and professionals to pursue their interest in science. Monies raised for this project go primarily for prizes for the students. Corporate support for this event begins at $250 with “best exposure” at the $1,000 plus level. Donations of $1,000 or more can expect their company name to appear on the banners that are placed throughout the event. It also ensures a spot on the front cover of the brochure as well as on the many posters that are placed in local libraries, schools etc. Won’t you please consider sponsoring our Tri-County Science Technology Fair? Your contribution would enable local children from Rockland, Putnam and Westchester Counties, the OPPORTUNITY to compete on a regional level — a prerequisite for high-school students to compete on a statewide level. Prior to the inception of the Tri-County Science & Technology Fair back in 1992, students were UNABLE to compete at a county-wide science fair because there was no regional competition available. With an increasing number of participants each year comes an increase in the expenses we incur in staging this fair. Not only does your support reinforce your company’s presence in the community, but it is a continuing pledge and show of support that our children NEED continuous exposure to mathematics, the sciences and technology to further their interest, knowledge and education in these areas. These students are our future engineers, scientists, biologists, doctors, educators. THEY ARE OUR FUTURE. Aren’t they worth the investment? Past sponsors have included: Praxair, Ciba Specialty Chemicals, PepsiCo Global R&D, Industrial Theater Inc., Philips Research, Duracell, Texaco, Consumers Union, Country Bank, Science Teachers Association of NYC (Westchester Section), Engelhard, TRC Raymond Keyes Associates, Todd Newman, CPA, Hudson Valley Council of Technical Societies, Westchester/Putnam Technology Educators Association, St. Joseph’s School PTA, St. John the Baptist PTA, Milea Hudson Valley Truck Center, Transnuclear, St. John the Evangelist PTA, Harrison High School, and individual donors without whose support these students would have missed an additional opportunity to display their scientific thought and talent. All donations are recognized in the brochure distributed at the Fair. All donations are tax deductible (per 501 (c) 3 and are recognized in our program the day of the Tri-County Science & Technology Fair. To make a donation simply write a check payable to PCDC and put Tri County Science & Technology Fair in the memo. This insures that the monies will only be used for the Fair. To mail the check to PCDC, Attn J. Newman – PO Box 222 Carmel, NY 10512. Use PayPal: Jnewman@DiscoveryCtr.org or donate now using this link. This science fair has been organized for the sole benefit of all grade-level students throughout Putnam, Westchester, and Rockland counties in New York. Our goals in staging this science fair are:1. To provide a competition in which students can compete on a regional level against other students within their grade level from surrounding community schools, both public and private.2. To provide a public event which would encourage students, by learning from other students, to pursue their own interests and studies in the fields of science and technology.3. To provide a public forum where students can display their own visual interpretation of a scientific concept or principle, or technological application, that the student has learned in school, by independent studies or by his/her own developed interest; a forum whereby students, in the process of designing an developing a science project from concept to presentation, exercise specific preparation skills (such as data gathering, evaluation, problem solving, decision making, thought process, and creative thinking).4. To provide a public display of student progress in their education of science and technology, thereby encouraging active, continual involvement by parents, guardians, educators, governments, and the community as a whole, to act as mentors, teachers and supporters of our children as they continue their studies in those fields.The following paragraph applies to High School Entrants only!!! 5. To establish a regional science fair whereby high school students from the designated Tri-county area could compete on the required regional level, thus allowing them to further compete on a statewide level, if the students desire to do so. I would like to take this opportunity on behalf of the Westchester-Putnam Technology Educators Association to continue the support of the fine science and technology related activities your center provides our teachers and their students. The Science & technology Fair is an excellent learning experience for all that participate. The Westchester Section of the Science Teacher’s Association of New York State is proud to acknowledge the continuing contribution to science education made by the Putnam Children’s Discovery Center…It is more important than ever that we look for avenues that can enrich and enhance the curricula which is presented in schools. The hard work and dedication of the staff of the Putnam Children’s Discovery Center provides a mechanism for students to pursue and master science concepts, talk with experts in the sciences, and have fun at the same time…We plan to continue to support their activities. I want to thank you and the Tri-County Science & Technology Fair Committee for giving me that opportunity to exhibit my research project, and for the generous prize awarded to me. On April 26th, I had the pleasure of competing in the Tri-County Science and Technology Fair. I would like to thank you for sponsoring this event. The Fair was a real learning experience. I genuinely enjoyed the judging. I would also like to thank you for the generous award of $100 I received for placing first in the Environmental category. College is always an expensive endeavor. This will definitely help me defray the costs. I hope you will continue to sponsor the Tri-County Fair in the future. Student, Sanders Trades & Technical High School, Yonkers, NY.